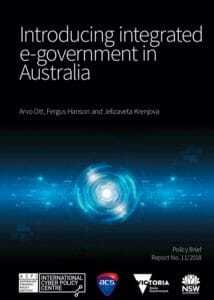 Arvo Ott, Jelizaveta Kernjova (eGA) and Fergus Hanson, Australian Strategic Policy Institute (ASPI) compiled a joint Policy Brief for Australian Government to develop an integrated approach to e-government and involve digital technologies even more in daily governance and economy. Arvo Ott, Jelizaveta Kernjova (eGA) and Fergus Hanson (ASPI) compiled a joint Policy Brief for the Australian Government to develop an integrated approach to e-government and involve digital technologies even more in daily governance and economy. According to Yohan Ramasundara, President of the Australian Computer Society, further adoption of digital technologies across the economy has the potential to add an extra 66 billion AUD (41.5 billion EUR) to Australia’s GDP over the next five years alone. “So the case for change is clear; the question is really about how to do it. How do we maximise the opportunities, while best protecting citizens’ data and privacy? This policy brief is intended to start that conversation,” Yohan Ramasundara wrote in the foreword. The authors of the research pointed out that the integrated approach to e-government should be customised to Australia’s unique circumstances and be designed to reduce business transaction costs, allow citizens to engage seamlessly with the federal, state and local governments and prioritise citizens’ control and ownership of their data. As the solution, the authors recommend developing an integrated government back office and a simple, easy-to-use and secure eID and digital signature.